I love plastic surgery and feel so lucky that I get to do what I do. I have never woken up and not wanted to go to work. I take my work very seriously but have a lot of fun in the process. I work with great people. My staff is an amazing team and they really care for my patients, for each other, and for me. It is a real treat to work in such a wonderful environment. I love the creativity and artistry required to sculpt a beautiful result. The same way a painter sees art on a blank canvas or a sculptor sees a statue in a piece of rock, I see the potential beauty in my patients’ form. I see the hidden youth and attractiveness in patients considering a facelift or eyelid surgery. For patients considering a breast lift or breast augmentation I see the potential to create a beautiful shape. For patients considering a tummy tuck or liposuction I can envision the contours and enhanced appearance. I love being able to see this potential and then use the skills I have developed over the years to try and deliver that to my patients. I love the precision and the dedication to perfection it takes to do what I do well. In some cases, less than a single millimetre of error is the difference between success and catastrophe. Although many might find this stressful, I find it exhilarating. After everything turns out well, it gives me a sense of pride and accomplishment. I also love the relationships I make with my patients. I spend a lot of time with my patients before, during and after surgery. During that time, we get to know each other well. As much as I enjoy surgery, the whole purpose is to care for patients. These relationships make my work and life richer. People put their trust and faith in me. They put their hopes in me to fulfill the dreams they have for their appearance. I feel very honoured by that and take that responsibility very seriously. My job is to perform excellent surgery to help my patients obtain their goals, enhance their self-esteem and possibly to even make them happier. I pride myself on being not just a plastic surgeon, but a doctor first and foremost. And at the heart of being a great doctor is the people you care for. However, the most fun part of my job… this may surprise you, as most people think that surgeons just want to operate, which I definitely do… but for me the very best part of my job is the “big reveal”. When we remove the dressings and patients get to see what it was all for. I love the look of my patient’s face when they see their new body. Their pretty new shape. Their younger face. I love hearing how that makes them feel. I love the jaw-drop stares of spouses as they see their wife’s new body. I love the joyful tears people get when they realize what a change they have gone through. That more than anything is the biggest rush in what I do. Do I feel lucky to be a plastic surgeon? I sure do and I feel thankful every day. To book a consultation with Dr Rodger Shortt, click here or telephone 905-849-4282. 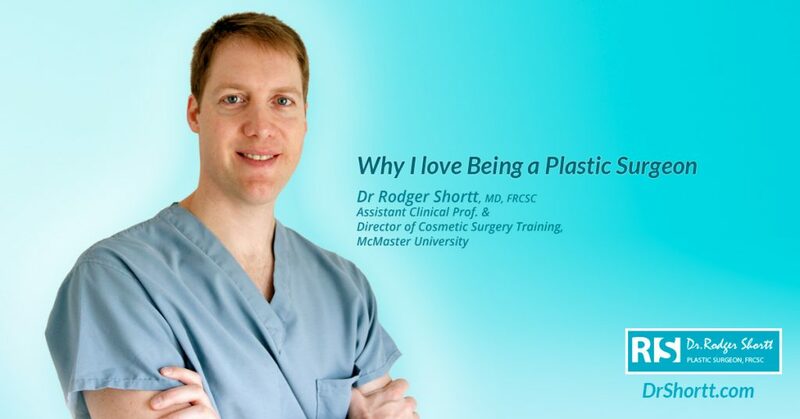 Dr Rodger Shortt is a specialist plastic surgeon who graduated from Queen’s Medical School in 2004 and became certified by the Royal College of Physicians and Surgeons of Canada in 2009. He received further sub-specialty fellowship training with international plastic surgeons in micro-vascular breast reconstruction, cosmetic plastic surgery, and body contouring after bariatric (gastric banding) surgery, significant weight loss or post-pregnancy. Dr Rodger Shortt strives to be the best plastic surgeon in breast surgery, tummy tuck surgery and mommy makeover procedures. and is committed to providing high quality patient care and achieving excellent results. He is considered one of the top plastic surgeons and one of the few plastic surgeons in Canada that has the top rating of five stars in Realself, Rate MD, and Ontario Doctor review.